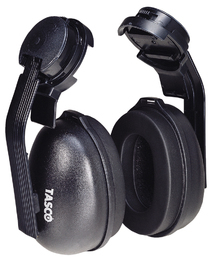 Tasco Blackhawk Hard Hat Model Ear Muffs are one of Tasco's most economical hard hat model ear muffs. These quality dielectric ear muffs feature Tasco's patented Soft-Seal™ ear cup cushions and a light weight design for improved comfort. Available with black or hi viz green ear cups.